← Thanks for 10,000+ hits! 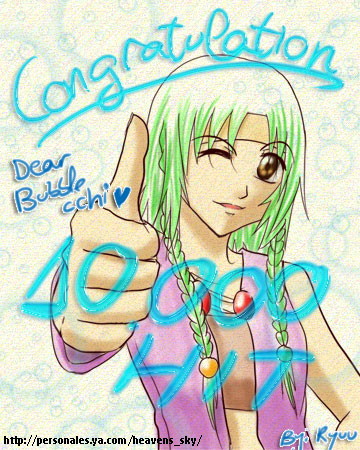 My friend Ryuuchan has drawn me a picture in celebration of 10,000+ hits! Thanks Ryuuchan! Good luck with your game project! This entry was posted in Site News and tagged hit celebration, site, thanks. Bookmark the permalink. 3 Responses to A 10,000+ hits gift! Just waltz in your blog and wanna say Hi! And about the Kingdom Hearts 358 2 Days. The three of them have such peculiar name except for Hayner. I mean Its ok, right? I mean, Pence? That sure a 78% sounds like Fence. Congratulations Bubble,I’ll link you up to the RPG me,and a group of university friends are working on once we upload material. Thanks for you contributions. I’m certain that this must be truly time consuming. Just wanted to bid honor were honor it is due.